Today, because it’s nearly Thanksgiving, I think we should roast a turkey and make some gravy. 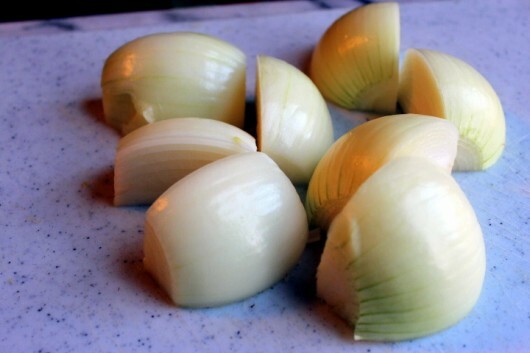 My low-carb, gluten-free gravy is thickened with apples and onions, and brightly scented with herbs. You’ll want to sip it out of a mug. 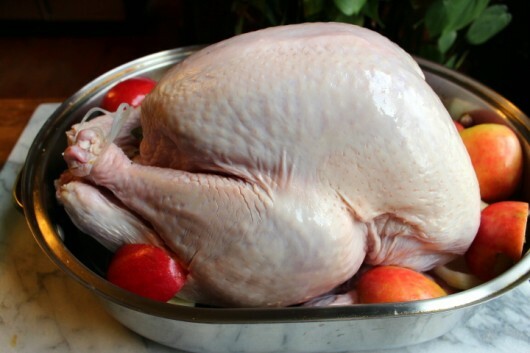 At least a day before Thanksgiving, brine the turkey. 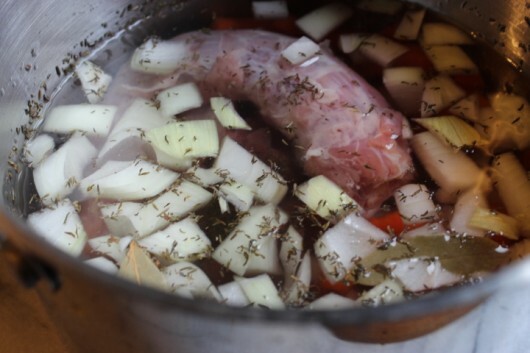 Click here for my wet-brine formula; click here to see my dry-brine method. And core and quarter them. A note about Braeburn apples. 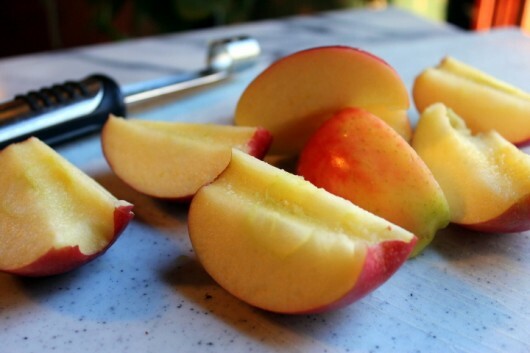 These red-streaked, yellow-green apples have a sweet, apple-y taste, and a fairly firm texture. 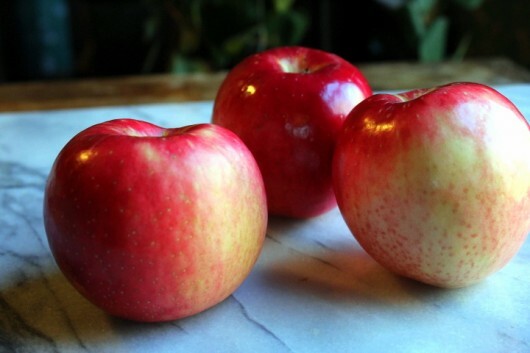 If you can’t find the variety at your local orchard or supermarket, just use ‘Granny Smith’ or ‘Golden Delicious’ apples. And cut them into quarters. 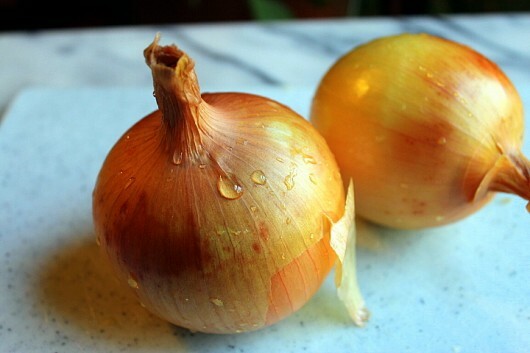 If your onions are particularly large, you can cut them into eighths. Put the turkey on a rack in a roasting pan, fold the wings under, and pat the skin dry with paper towels. I hope you remembered to remove the giblets and neck from the bird before you brined it. You’ll want these bits for stock. 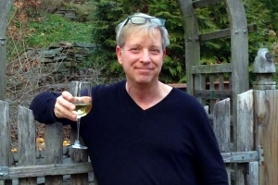 True story: Twenty years ago, and before we met, my husband hosted a Thanksgiving dinner party. He put the turkey in the oven without removing the plastic bag of giblets. As the bird cooked, his guests noticed a horrid odor wafting from the oven. Needless to say, no one ate the turkey. No one, that is, except for the intrepid host. And, if you have it, a sprig of fresh sage. Scatter the remaining apple and onion segments all around the perimeter of the pan. And give it a generous sprinkling of salt, pepper, and thyme leaves. Then crisscross the legs, and tie them in place with kitchen string (or stick them into the plastic clamp that came with your turkey). Roast on the lower-middle rack of a preheated 325°F oven until a thermometer inserted in the thickest part of the thigh registers 165°F. 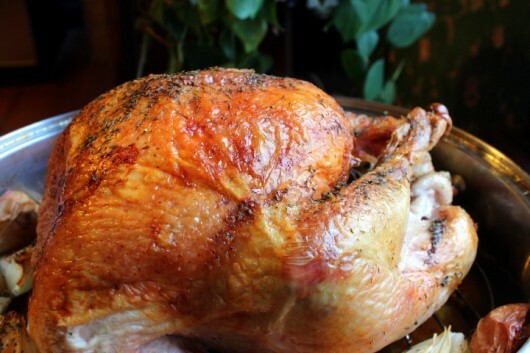 Transfer the turkey to a plate or platter, and keep it warm beneath a tent of aluminum foil. 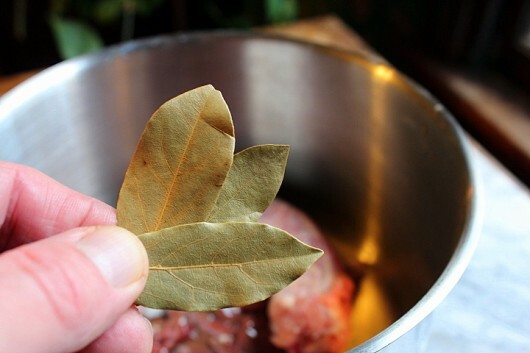 An hour or more before the turkey is done, put the giblets and neck in a saucepan, and add 3 Turkish bay leaves. Turkish bay leaves are infinitely more flavorful than their domestic kin. Also add 1 quart of water, some salt, pepper, thyme leaves, cloves, and chopped up celery, carrot, and onion (you’ll find exact quantities in the printable version below). Bring the stock to a boil over a high flame. Then lower the heat, partially cover the pot, and let simmer quietly for 45 minutes. And pour the liquid into the roasting pan. Bring the works to a simmer, and then mash the apples with a potato masher. Then grab your handy-dandy stick blender, and puree the sauce. The apples and onions will thicken the liquid — you won’t need to add cornstarch or flour. At this point, a thought or two might be running through your head. Thought #1: Kevin, you’re a genius! You’ve created a low-carb, gluten-free gravy! Thought #2: Kevin, you’re an idiot! You forgot to degrease the sauce! In truth, I never degrease my Thanksgiving gravy. Why? Because the fat contributes a ton of flavor. My favorite way to prepare the holiday turkey. Apples and onions, which roast along with the bird, will thicken the gravy to the perfect consistency. You won't have to add cornstarch or flour. Adjust the oven rack to the lower-middle position; preheat oven to 325°F. Put the bird on a rack in a roasting pan. Tuck 2 or 3 apple and onion wedges into the large cavity; add the (optional) sage. Scatter the remaining apples and onions all around the perimeter of the pan. 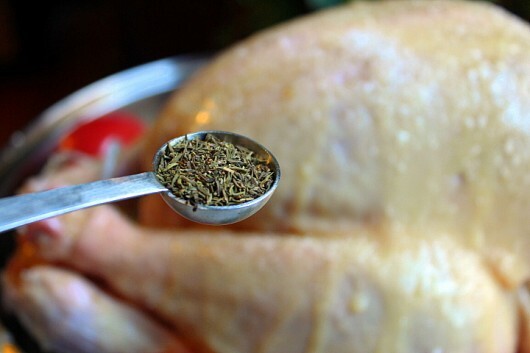 Then brush the turkey with the melted butter, and sprinkle it generously with the salt, pepper, and thyme. Crisscross the legs, and tie them in place with kitchen twine. Roast until a thermometer inserted in the thickest part of the thigh registers 165°F -- about 3 hours. 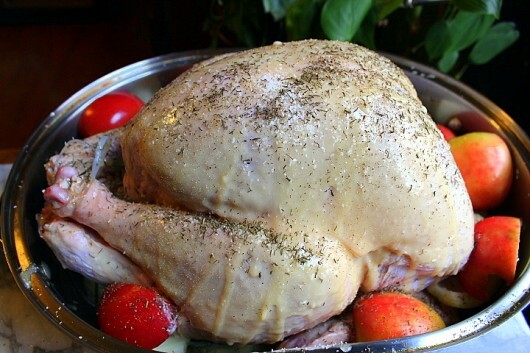 Transfer the bird to a plate or platter, and keep it warm beneath a tent of aluminum foil. 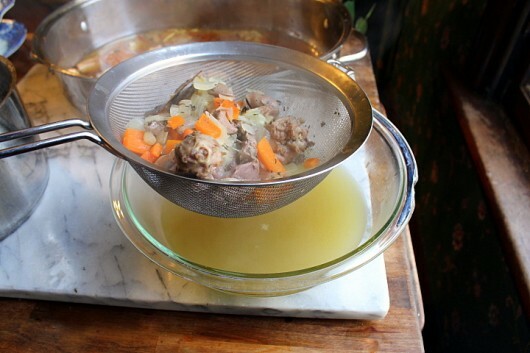 To make the gravy, put the turkey neck and giblets in a medium saucepan. Add the bay leaves, onion, celery, carrot (optional), cloves and thyme. Cover with 1 quart of water. Bring to a boil over a high flame, then lower the heat, partially cover the pan, and let simmer quietly for 45 minutes. Strain the stock through a wire-mesh sieve. 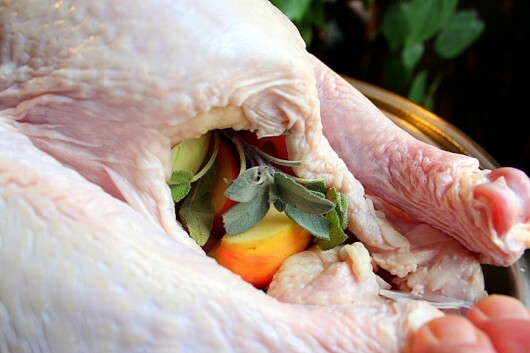 Not sure how to brine a turkey? The directions are here. Wanna see all of my Thanksgiving recipes and platter-decorating tips? I’ve bundled them up for you. GF Bacon and Sausage Stuffing Balls! I am SO making this for Thanksgiving, along with your amazing bacon and sausage stuffing! Kevin, I love your recipes. Braeburns are my favorite apples, but I never thought of using them for gravy! Clever! This looks so good! As Emma said, what a good idea to thicken the sauce with apples instead of flour. Thanks Kevin. I’m getting company! Big hugs to you Kevin for this brilliant idea! I’m spending my first Thanksgiving gluten-free due to a celiac diagnosis and hoping I can pull it off on my gluten eating family!! You’ve saved thanksgiving! I especially appreciate you posting this before I left for the store! that almost sounds like a gravy that “I” could make! Happy Thanksgiving to all! I actually missed seeing Miss Lily, your sous chef, helping! I’ll have to make note of your fantastic gravy recipe for next year Kevin! And I nearly cried as I read the link to your post from last year, regarding USDA recommendations for rinsing the turkey. I went and rinsed TWO yesterday in preparation for dry brining. Then, I spent probably an hour, with bleach, disinfecting just about everything. My lungs and hands were not happy! Aside from that fiasco, my son, DIL and year old grandson are on their way as I type from So Cal, and all I want to do is smother that baby with hugs and kisses. So in the end, all is right, I’ve learned a big lesson, and wishing you and yours a wonderful Thanksgiving!!! Snowstorm tomorrow, what? We are going to Cooperstown for Thanksgiving, sure hope the storm doesn’t hit there too. Thank you for the delicious sounding gravy recipe. Now I can make myself some to take and I won’t be eating just a baked potato and turkey. My family doesn’t understand my food allergies and somehow end up putting something in every dish that will make me ill. (They try but truly don’t understand). I always take myself some safe food to eat but it’s just not the same as eating a full holiday meal. Due to illness I can’t fix myself a full holiday meal or host a family gathering anymore. Your gluten free recipes are delicious. Thank you! Have a wonderful Thanksgiving. Kevin, It’s Judy out here on the Central Illinois Prairie. I have always followed my grandma’s (and now I am a grandma!) never fail way to do turkey and roast chicken. She used apples and onions as do you along with lots of carrots, salt and pepper. 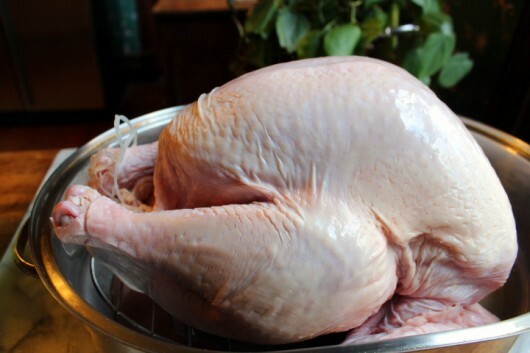 The bird is cooked on 325 degrees for as long as it takes to become tender BUT IN A COVERED TURKEY ROASTER! Then pulled apart and left to soak in pan dripping altho I defat by inserting a few ice cubes. One does not really miss the drama of presenting an entire beautifully browned bird — of course lots of parsley and other nice garnish items. But I never thought of pulverizing the apples and onions to thicken the gravy!!! I need to get me one of those “stick blenders.” Have blessed Thanksgiving! I try to keep the animal fats off our plates. My husband has had 3 strokes and has to keep cholesterol under control. I found a fast was to degrease. I pour all my drippings into a sun tea jar that has the spout at the bottom. Instant separation and on with the cooking! If I need an oil I can substitute with olive oil. Cheers to all! I am definitely giving this a try. We smoke our turkey but I think I can alter the steps a bit to make it work or come close. Stay warm. I am terrible at baking turkeys and rarely do so. The last one I cooked cost me $52 and it was several years ago. My mother always makes a really nice one and has all the kids over with their families. 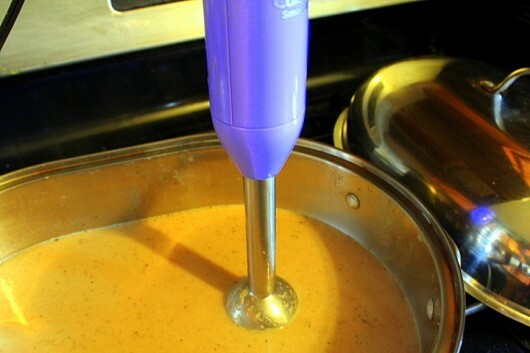 I love the idea of the immersion blender for thickening the gravy – spot on! I hope you don’t get too much snow tomorrow, Kevin. We are in the 3-6″ swath, so they tell us now, but they could be pulling our (turkey) leg. Sheri – Well. If you can forgive my typos, then I can certainly forgive yours. Happy Thanksgiving! Beverly – I’m hoping this storm is a turkey, not a bear. My gardens and I are still recuperating from last winter! Wishing you a very Happy Thanksgiving Kevin. Just one of many things I am thankful for, are your email and Facebook shares, they bring beauty and joy to my heart! God bless you with continuing love of home and hearth! 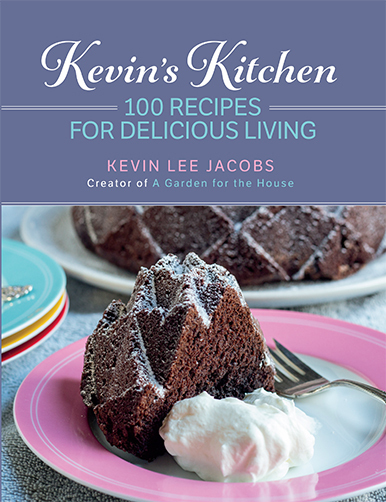 Hi Kevin, I will go with ‘your a genius” great idea I have never seen a recipe quit like this. I’m used to making gravy with the pan juices from the turkey- would your recipe work with that or is it necessary to make the stock? 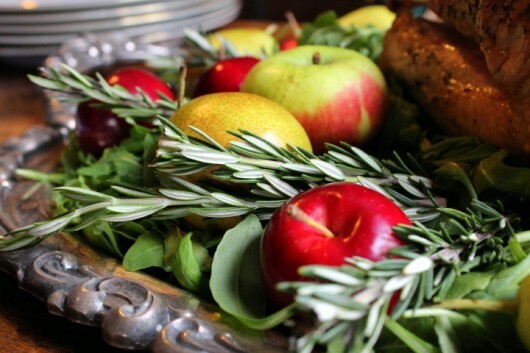 I make a stuffing for duck with apples, almonds and raisins. People who hate duck love this. Thought #3. Wishing you and your beloved a holiday season that is full of joy. I thought you could not make gravy from the drippings of a brined turkey because it would be too salty. That is why I only made brined turkey once. We love gravy. ???? Yum! I’m not a gravy person, but you may have made me a convert! We’re going to be at a large family gathering. Our contribution is the dressing…not stuffing as it’s not going inside! My NY mother in law taught me and her son, who takes proprietary lead, to fix a delicious casserole of cracked wheat bread, stewed tomatoes, apples, onions, celery and sausage, and poultry seasoning. This year we’ll be doing a separate casserole for those who don’t eat sausage. I’m going to be checking out your dressing recipe with bacon, and come Christmas when we have turkey here, will make the gravy Kevin’s way…..can hardly wait! HI Susan – I only brine organic turkeys. Most commercial birds (“Butterball,” “Shady Brook Farms”, etc.) are already injected with a saline solution. If you brine them, they can indeed be too salty. More details in this post. Now I know why you do all the cooking! I’m so glad you posted this again Kevin! I fixed my oven! Yes! I actually ordered & fixed the “Control Board” myself! I just can’t wait until Thanksgiving and I have a 20 lb bird in the frig. It was a challenge cooking stove top for a whole year but I would not advise anyone to suffer so! Cheers! and the best of holidays from the San Juans of WA. State! I can’t wait to try the apple onion gravy! I wonder if the texture and taste will be the same if I degrease a bit? The giblets package reminds me of my first attempt of feeding our immediate family of then 22 people Thanksgiving dinner. I was a new bride and I worked so hard! I was so nervous! There were so many side dishes that had to finish at the same time! Ahh it all looked so beautiful until my husband started to carve and my beautiful turkey gave birth to a big plastic bag of stuff. I will never forget their looks. Everybody laughs about that now and somehow Thanksgiving dinner is one of the easiest dinners for me to pull off. We deep fry our bird. 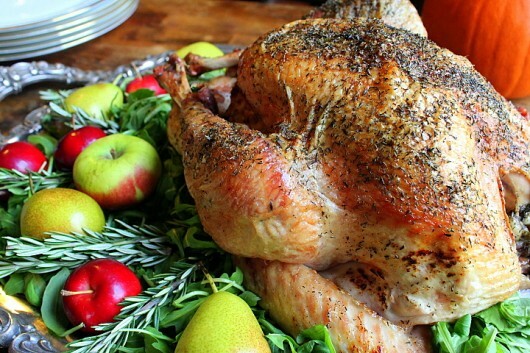 I makes a really juicy and flavorful turkey and, more importantly, it frees up the oven for cooking sides. The problem here? No pan drippings! How do you make a good gravy with no pan drippings? I make a huge pot of turkey stock this week to freeze an use for all things Thanksgiving, but stock alone does not make up for that missing fond! Will have to try this. Sounds delicious. I put a chopped apple in my stuffing. What great flavor it adds. Happy Thanksgiving and thanks for all you share. I am so glad you don’t degrease the gravey, because I too think that is where so much flavor comes from. Yes that is what I really need. THANK YOU THANK YOU THANK YOU for this GF recipe! ! I totally agree with your not “degreasing” the gravy. That is half the flavor !!! ( along with not losing all of the turkey bits and pieces while trying to skim the fat ) . Delete your calories somewhere else on another day. Because gluten free is not the only condition my dear has, I will use ground, yellow flax meal to thicken the gravy. I also follow FODMAPS which means no apples. 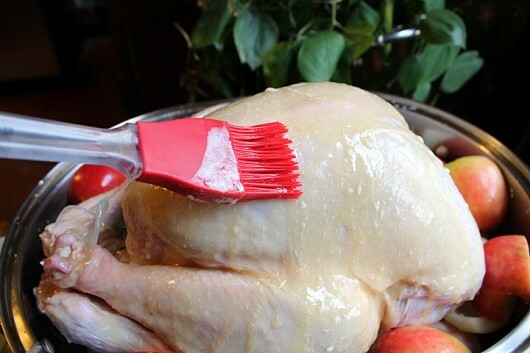 As for the turkey- we melt butter and mix it with white wine to baste the turkey. Otherwise the recipe is spot on. Thank you so much for the gravy recipe. I have been using arrowroot in place of cornstarch on my grain free diet, but am looking forward to something new. Have to check whether the co op has Turkish bay leaves. Making your gravy now. Happy Day. I made this last year Kevin and it was delicious. I used leftover gravy and juices as the base for soup into which I put the last of the meat removable from the bones by way of the slowcooker. I am looking forward to more of the soup, and, of course, the turkey itself. Hi Anne – I’m so glad this turkey and gravy combo worked out for you. Happy Thanksgiving! I’ll be cooking for three but am going to try this recipe just because you’ve inspired me and because our grocery store does offer organic turkeys. 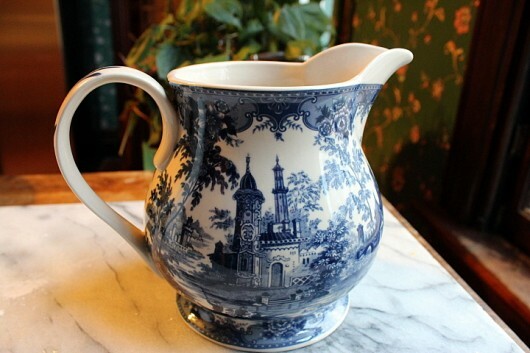 Your pics are helpful and I like your servingware. Happy Thanksgiving, Kevin. 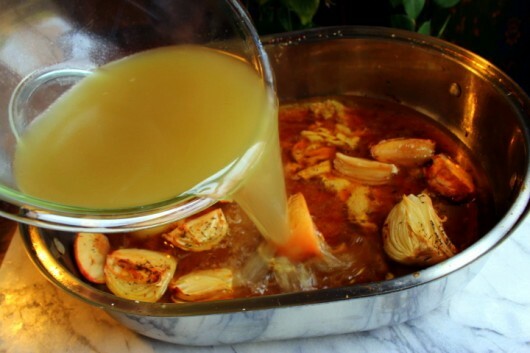 Thank you for your wonderful post about turkey brining. I won’t be brining mine since it’s a kosher turkey and already has enough salt from the koshering process. I will be making your fabulous gravy, though! I love reading about your messes and successes. You write in such an entertaining and relatable way. This sounds delicious! I have cooked my turkey (breast down as my mom always said, “so all the juices run into the breast meat”, but not good if you want to present the turkey whole!) 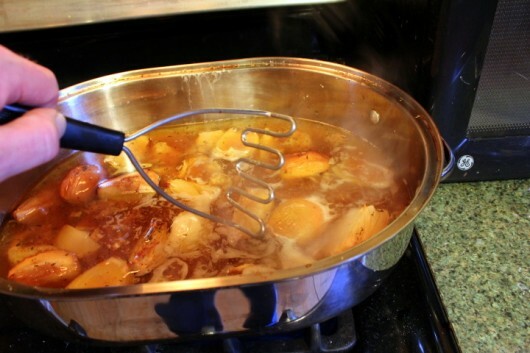 in about 1-2 cups fresh apple cider and the drippings make a wonderful gravy, but it does need to be thickened. I look forward to trying your method on my next turkey. Kevin! Exactly what I’ve been looking for! Just started keto myself and in planning out thanksgiving dinner, stumped over gravy w/o flour. Had forgotten your technique of drippings, stock, puréed roasted veg!!! You are a genius! Thanks so very much!!! My hero! Holler if you’re looking for keto friendly stuffing. One been recommended to me used homemade quick bread using almond and coconut flours, 2.5g carb per slice! Thanks again! Wowser! Gonna do this for sure. You are AMAZING! Thanks, blessings, gratitude for seeing fall where you are (there is less “autumn” here in GA)… and for this blog. I’m always looking forward to the next one. It is ALL good, again and again!